Description: 180g LP remastered from original analog master tapes! Mastered by Bernie Grundman and pressed at Pallas in Germany! 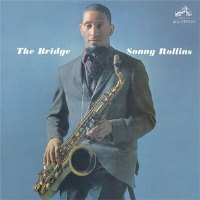 How badly did Sonny Rollins want to refine his playing? The saxophonist shocked the world in 1959 and took a break, returning in 1962 with this splendiferous set, named after the Williamsburg Bridge, where he practiced by himself. He?? ?s paired here with guitarist Jim Hall, whose communicative lines, along with Rollins??? esteemed solos and melancholy patterns, gives The Bridge lofty status. The quartet tackles both originals and standards such as Billie Holiday's "God Bless the Child" and Cole Porter's "You Do Something to Me," turning up aces every time. Mastered from the original master tapes, ORG Music's 180g LP presents this RCA classic in the finest analog sound it's ever known. Everything from each of Rollins' dip-and-dive patterns to the patter of Ben Riley's drums is heard with extreme detail and range. Recorded on January 30, February 13 and 14, 1962. Originally released by RCA. This vinyl reissue released by ORG Music in 2012.